The Heiniger ONE Shearing Machine makes a back-breaking job much easier by being reliable and able to do the job without hesitation. It’s the go-to shearing machine for large flock shearing. 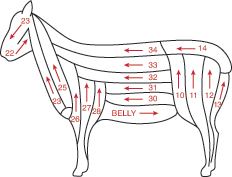 The two diagrams above demonstrate a typical shearing pattern. Positive hand—know exactly where the handpiece has to go; don’t poke, be positive with all blows. Good wrist—must be flexible and supple to ensure comb points stay on the skin. Return action—must be fast, close to the sheep and taken no further back than the start of the next blow; wasted inches are wasted effort. Left hand—use it confidently to prepare the way for the handpiece. 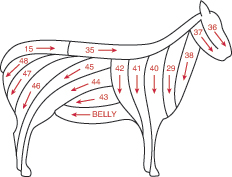 Rhythm and timing—develop a rhythm so the shearing of each section runs smoothly into the next. View an instructional video demonstrated and narrated by Ivan Kaden, professional shearer.